Simply by flying Paris –> Chennai, blissfully giddy and naively wide-smiling, we were each individually in the process of terrorizing the planet with a nearly two ton carbon emission. Two TONS. Not to get all India on you, but that’s roughly two elephants. EACH. And that was only flying one way. As we collectively sat today among animals and trees, filling out our carbon footprint calculators for our time spent in Auroville, this realization and several more were happy to smack us in our faces. I got all excited, checking off boxes with zeroes for my vegan diet and Auroville bike riding mastery which was seemingly causing my number to dwindle. What I realized is that that’s just the problem- I, and perhaps “we”, are too quick to laud our small steps toward making a difference and don’t always keep the big picture in mind. Today, with my hands in a whole lot of cow excrement and red clay warpaint on my face, everything came full circle. Katherine, an AUPer of previous years but now more appropriately titled Aurovillian Carbon Reduction Queen, came on this same trip last year. She ended up not leaving. She took on this project with Martanda, who is the lucky and happy “inheritor”* of the land they are reforesting on. There are innumerable reforestation projects taking place in Auroville, and for good reason. This place began as a massive expanse of red earth (ironically, or not, sounding very much like mars) which was deemed impossible to cultivate and dead. Now it exists as a lush green jungle of various types of trees and lots of dedication from stewards like Martanda. The green belt, one of the concentric circles that makes up the space-ageish layout of Auroville, consists primarily of reforestation projects and communities which engage with them. Hence, it is a great place to support these initiatives while also carbon offsetting by planting trees- tropical deciduous evergreen trees in particular. To offset our flight one way, we planted five mahogany trees today. Whether or not this is enough I’m not entirely sure, and that’s one of the problems with carbon offsetting that Katherine explained- Are we just putting a band-aid on a much larger problem? Are we taking part in these offsetting tactics as a means for pretending we’re not doing any harm? There are, of course, a million and five ways you can look at this issue. 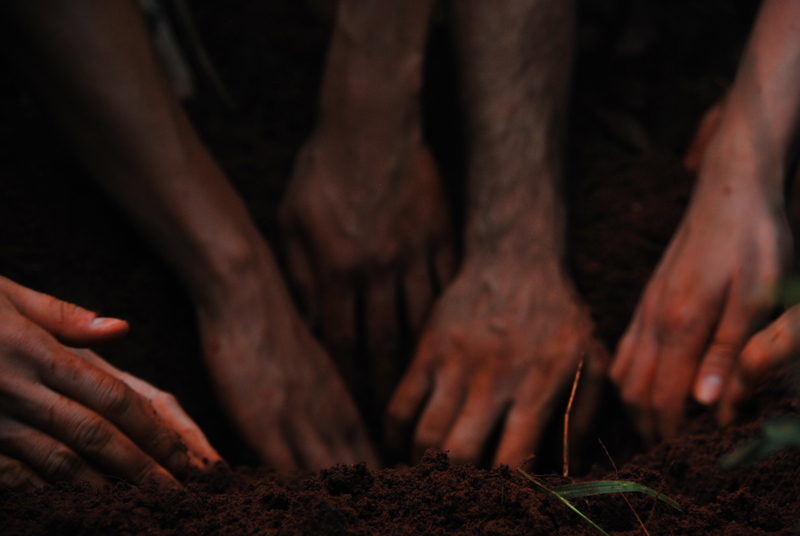 Primarily, I was just happy to get dirty and help something grow. Being in close contact with the earth and helping to be part of something larger, like contributing positively to the environment, is not only good for bragging rights but it’s also a huge part of the Auroville mindset. I asked Martanda if he had grown up with an interest in forestry or if it simply developed with him having to take care of this massive playground of plant life. He explained that it was serendipitous (like many things in Auroville ostensibly are), that as a child he always had a very close relationship with the land and he rediscovered that and how truly important it was to him once he was put in a position of caring for something so delicate. This consciousness of the delicate and all-powerful quality of the earth, of the environment, is something that the Mother (grand initiator of all things Auroville) recognized and theorized about. She named several trees and flowers, imbuing them with human qualities and characteristics of encouragement. I heard from Martanda about things like “Courage” and “Certitude” as pseudonyms for trees, and how she came up with similar deviations for flowers based on their vibrations. Even in writing it, it certainly sounds crazy but after being in direct contact with something alive, with it’s roots and arms, I couldn’t deny that maybe I understood what he meant. We had dug, churned, composted, planted and finally danced our way into a unity with these little saplings. I say danced, because in order to culminate our project we had to devise some great ritual to signify the birth of a new tree in the forest- my group painted everyone’s faces and started a conga line. Other groups sang in high-pitched Oms or started an eyes-closed hand holding circle where we all did the Wave. Another group encourage everyone in their hand-holding circle to finish the sentence “If I were a tree…”, which rounded out with a great variety of things from “I would be taller” to “I would house fairies”. *Lest we forget, nothing belongs to anyone in Auroville, so nothing can truly be bought or owned or inherited.